A few weeks ago, I attended a Downy event hosted by Miss Lauren Conrad and learned something that has forever changed my laundry routine. Apparently, I was using Downy Unstoppables incorrectly since the DAY I brought them into my home. They are not softener replacements…. NOT AT ALL! Instead, Downy Unstoppables are scent boosters – created to help us go beyond everyday freshness. They can also keep fabrics smelling fresh for up to 12 weeks in storage. 12 weeks folks! That’s some powerful stuff! Now that I know which way is up I decided to do a little video explaining the Downy Difference. Take a look and then enter my contest below! You spend a lot on clothes and all it takes is a little Downy to help them stay newer for longer since using Downy preserves fabric over detergent alone. Two winners will walk away with a Downy Difference Kit which include an Ultra Downy April Fresh, Downy Unstopables Spring, and a Downy blue t-shirt within them. You will also receive a $50 gift card that you can use to buy more clothes to transform with Downy. I would and I would get the lush scent. I think I’d most like the Downy Unstoppables Lush, I would try it. I’d try the Spring scent I think! I would try the Lavender Serenity & Lush Unstopables. Yes, I would try Downy Unstoppables – the April Fresh. I love the way it makes my laundry smell good for weeks! I have tried the Fresh scent and love it! Yes,Downy Unstoppables Lush, I would love to try it. The shimmer scent sounds intriguing. Yes, I’d love to try the Shimmer or Spring! But, they all sound lovely! I Would Love To Try The Shimmer Scent! I have used the fresh scent unstopables several times. I would try the spring scent! Spring is always lovely. Yes, I would try unstopables. I think the fresh scent. I would try the Fresh scent. I would try the Lush scent. I think I will give them a try. The Lush scent sounds nice. I would try the spring scent. Yes I’d try it. I’d get whichever scent smells like the freshest. I would definitely try unstoppables! Especially in my towels and whites, like my husbands undershirts. We could use a little extra pleasant scent there! I would love the fresh scent. Great video by the way, especially the tip you learned about putting the crystals on the bottom instead of sprinkling on top! I would like to try Unstoppables Spring. I would love to try Fresh. I would try them, probably the fresh scent. Yes I’d love to try the Spring scent! Yes I would in Spring. I have tried them before and really liked them, but as a coupon enthusiast, I find them to be a tad pricey! I would try Downy Unstopables in the Fresh scent. I will try, I’d like to try the Spring scent! Yes I would love to try the spring scent. I would love to try the april fresh scent, it would be so nice for my sheets! I’ve tried the spring scent and I love it!! I would like to try the spring scent. They smell so amazing. I’ve tried them before, and I’d want the spring scent! I have already tried the fresh scent before and I liked it. I would try the fresh scent. I don’t really use stuff like that on clothes, but I like them for sheets. I would love to try the Downy Unstopables Shimmer scent…they sound terrific! Thanks so much for hosting this giveaway! I would try the spring scent – I usually love springy fresh scents in my laundry! I have tried them, I like the Fresh Scent. Fresh Scent! i love downy and fresh clean smelling clothes, I would try this. I would like to try Downy Unstopables in the Fresh scent. I would love to try the Downy Unstopables. All the scents sound great but I want to try Lush most. I’d like to try the Fresh scent. I would love to try the Spring scent. I like fresh smells. I would love to try them in spring scent. I would love to try the spring unstoppables! I do use them, and my fave is the Fresh Scent. I would absolutely try Unstoppables. I want to try the Fresh scent. I love fresh scent. They work very nice. I HAVE tried the Spring so I would want to try the others. i have only tried the ‘fresh scent’ one and i love it, but i would love to try one of the other scents like ‘shimmer’! i would love to try the spring scent! I’ve tried the spring scent. I would love to try the fresh one. I’d love to try the Fresh scent! I would LOVE to try them in the spring fresh scent. I would try the Spring scent! I’ve never tried it before. I can’t say what “fresh scent” or “spring scent” smells like, so I guess I’d like any scent. LOL I just like good smelling detergent and fabric softener. Yes. I would love to try the Spring scent! 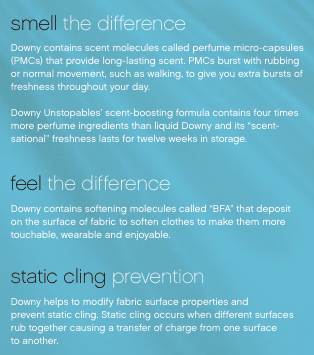 i want to try the fresh scent, i love downy! Yes, I’ll try them when I win this. Spring is my favorite season so I’d like that scent. I love the fresh scent and want to try them all! i would use unstoppables and would pick the fresh scent . I would like to try the Spring scent. I would like to try the Unstopables spring scent. We are crazy for the unstoppables in the fresh scent in this house!!! Yes I would love to try Fresh Scent! I’d try the Fresh Scent first. I’m fairly certain I’ve tried all the scents because we LOVE Unstopables. Our favorite right now is Shimmer. I wouldn’t try Unstoppables because I’m allergic to most scents. My daughter, however, loves them and uses them all the time. I would love to try Downy Unstoppables in Lush! I would love to try Downy Unstopables in Lush! I haven’t tried it, I’d like to though. I think the Spring scent would be the first one I would try. Ive tried it and love it. I’d love to try the Spring scent. Thanks for the chance! I would like to try the April Fresh scent. Yes, I would love to try the unstoppables fresh scent. Yes! I would use the Spring Scent! I would love to try the Spring scent. I’ve tried the fresh scent and loved it. I would try the other scents. like to try the spring scent! I would want the spring scent. I would try them and the fresh scent sounds nice. Thanks for having this contest. Thanks for the giveaway… Fresh Scent !